Earthbag houses in Coron, Philippines use perfectly shaped and aligned earthbags that are made in a wooden form and then set on the wall. I recently visited an incredible earthbag project in the Philippines. The earthbag houses are in Barangay Lajala, a coastal barangay near Coron that was devastated by super Typhoon Yolanda last year. About 90 percent of the houses in Barangay Lajala were completely destroyed while the other 10 percent were partly damaged. This is the largest earthbag project of its kind and so I will be posting numerous stories to document as many details as possible. They use a different earthbag method than anyone else. See below for details. The Tamayo Foundation is a corporate social responsibility (CSR) organization of DDT Construction, a construction company in Manila that is funding 100% of the project. Project management: Data Land, Inc. Currently they’re building 21 houses. Ten houses were finished in 2 months by 5 teams (6 workers per team). They build 5 houses at a time. Workers are paid, and they receive paid training while learning. Floor area: 28.89 sq. meters with one bedroom, one living room. Cooking is outdoors as is typical in SE Asia. Earthbags are made in a wooden form, tamped solid then immediately set on the wall where they receive final tamping and shaping. Wall reinforcing: opposing rebar on the interior and exterior surface of the earthbags tied together with doubled galvanized wire every 3 courses. This rebar is later covered with split bamboo. Bamboo treatment process done locally by 6 persons (one of the building teams): soak in sea water one week, dry, clean and sand off green coating, varnish. Anybody have experience getting a building permit for an earthbag home in the Philippines? Interesting for sure to get a permit, when we went to city hall they had no idea what to think especially when I said earthbag using dirt . So most Natural buildings here don’t need a permit. So we didn’t get one and has not been a problem. But I understand it is more strict now . What is important is that it gets an assessment of value so they can Tax you ..a key element with the city . Good luck , we enjoyed building this structure and now is still beautiful 3 years later and by the way no need for air conditioning. If you want to see pics email me . Mickey_burnich@yahoo.com. So much info here. Thank you all. I am planning to build a home in Panglao, Bohol. My land has very little in the way of topsoil as it is mostly limestone karst. i would love to build with earth bags however not really wanting to import soil for that. Does anyone have any experience with attempting this on Panglao or in Bohol? You do not need top soil to build with earthbags, in fact deeper soil with more clay is fine. I know of some earthbag buildings that were built with limestone debris from quarry that turned out well. Thanks for the response. So just to understand the limestone debris was put into the bags along with soil, sand and tamped as regular earthbags? i have seen and know you can get limestone debris from quarries here but i image there being a lot of air within the bags even after tamping. Any idea how this problem was solved or is it even a problem. Many thanks again for the info. Any air that gets trapped will only increase the insulation value, as long as the bags generally pack solidly enough. I live on Bohol and am thinking of doing the same thing have you started yet? I haven’t started yet, I am planning for 2019. Would be good to connect. Really questioning whether it will be possible or not. Will probably do some experimenting with crushed limestone in bags first. What are the temperatures like in earthbag homes in the humid lowland tropics? Are they more comfortable than concrete block homes? We are still planning to build an earthbag home in Southern Leyte, Philippines. The subsoils are kaolinite clay, which is a low shrinkage clay, which I think would make excellent though difficult to work with earthbags. Plans so far are 5 meter diameter circle with basement and a kubo or open second story with concrete floors over the basement and first story. Earthbags filled with most soils will behave similarly to concrete blocks thermally, in that they are both thermal mass materials. If you fill the bags with a more insulating material, like lightweight volcanic stone or rice hulls, then they will be more insulating. In the Philippines the average year-round temperature below ground is about 67 degrees F., so your basement area should be fairly comfortable. The air from the basement could be circulated to the upper level to help buffer temperatures there. Thank you for your quick reply. When I measure the water temperature from our 15 foot deep well it is 82 degrees in Laguna. In the 4 years I have lived in the Philippines I have never seen outside temperatures below 76 degrees. I would assume that soil temperatures would be the same as well water. Perhaps the temperature is 67 at Baggio, but in Laguna or other lower elevation areas I would think not. Where did you get 67 degrees? I would love it if it was the case in the lowlands. Am I incorrect? According to the chart at http://greenhomebuilding.com/pdf/GroundTemps.pdf the underground temperature in Manila is 67 degrees F. This is supposedly the average annual ambient temperature of that location. Perhaps they are wrong. We are in Northern Leyte and want to start an earthbag/living roof house sometime in 2019. Any info on the availability of Raschel tube rolls would be great. where in the Philippines we can buy this EarthBag or SandBag for building construction. And how much the price of each rolled Earthbag? because for me it’s cheaper for us poor..
People keep saying sand bags are hard to find in the PI. Not sure why because they’re very common in all of the surrounding countries as well as most countries worldwide. Your two best options are 1. use recycled polypropylene rice bags without plaster liners, 2. bring the bags or tubes with you from another country. Keep checking on the Internet also by searching for keywords such as Poly Bags, etc. You might also find them at feed stores and farm supply stores. Regular poly bags about 18″ x 30 or 32″ is the standard size. This size is measured when flat and empty. Narrow bags might tip over and wide bags take more work and materials. I want to build a completely underground home on the north east end of Cebu where I have property facing the Camotes Sea. Does any one have some plans for a 2bedroom, 1 bath home? My experience with the Philippines soil in Palawan is that it needs cement to stabilize the soil. Not enough cllay here. But we did mix the cement dry into the dirt and then added water . Also used the large rice sacks we found used in the local market place .for about 8 Php each. But avoid the shinny ones . They are too slippery. Our mix is 10 parts dirt to 1 part cement. Thanks for the feedback. You’re right. If the soil is too sandy (common on islands) then it’s best to add a stabilizer such as cement or lime. Great invention Dr Owen GeigerI! This is really beneficial for the earthquake, typhoon area. Will the walls be resistant to the frequently flooded area, will it not disolved? Which is stronger for the Roof Frame lumber or bamboo?I have seen an earth bag built in England country side the owner claimed he only spent £250.00 plus recycled materials. And watched a video in Australia; a family built their own individual bedroom around the parents home. I also like the Earthship built homes by Michael Reynold; the way they install the use of the water, the permanent room temperature and the no bills to pay monthly. I think I will conbine earthship and earth bag built to build my home e.g. the living room looks bright and pretty with coloured bottle buts on the walls, the woodfire heater in the middle and the secondary all glass wall/windows to catch the heat during cold weather. It’ll probably more expensive to build with earth stuffed used tires than bags. Every project has to be designed to meet the issues on that site. In this case they might want to stabilize lower walls with cement or lime to better resist flooding. Or use gravel bags. Lumber is typically longer lasting than bamboo, although if it’s treated properly then bamboo can last a long time. Several people are already building ‘earthbag earthships’. Their projects are described on this blog. The materials cost is about the same for either method. The main difference is earthbags require less labor than ramming tires with earth. Nice to see such a write up interesting. I’m currently building a Shop using gravel bags, first seven layers then rice hulls.In Baler Aurora. We are plastering using soil clay straw mix and about to treat the bamboo for the roof using boric and boron acid using a pressure vessel that I have made. Preasurising the fluid and pushing it through the the bamboo. Apartly able to last 30-50 years. Sounds great. Please document your project with photos and notes and share with others. Email me any time. Is it possible for my to volunteer and work on a home with your crew in order to learn the trade? Owen does not have a crew building this type of housing. I’m on Leyte and have also built a bamboo pressure treatment apparatus. Can you please tell me where you sourced the Borax and Boric Acid. We are building and earthbag/living roof house and would like to use treated bamboo poles for the main roof beams. We are building an earthbag structure in early 2017 (Feb-march) anyone who wants to come help with or without prior experience would be great. Anyone can contact me to offer some advice or specifics. We are in panglao island bohol. 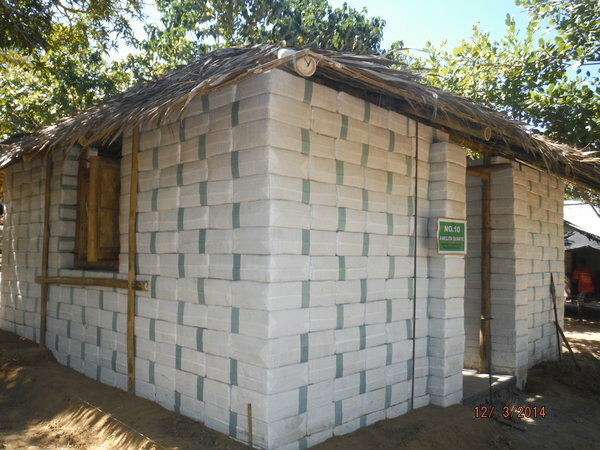 I have not checked out this project but live in Palawan and built a Earthbag house . The one concern to have is the soil composition..if you noticed the Coron project used about 12% cement to the soil. Because the soil does not have enough clay..
Can I get some info on this please? I’d like to build an earthbag home in Palawan too. You can visit them for details. Just realize their process is much slower and more labor intensive than other methods. They use custom bags that are not available to the public as far as I know. Plus, they fill and tamp the bags on the ground and lift the heavy bags up on the wall. No one else does it this way. The standard way is to fill bags or tubes on the wall. For instance, look at the schools and houses being built in Nepal and you’ll see perfectly straight, flat walls that go up in half the time. Tubes are faster than bags. We are near Tacloban and want to start our earthbag/living roof house this year. Can you build two-storey house from earthbags? But be aware that soil is very heavy and it’s difficult to lift all that weight high in air. It’s a very labor intensive process. For this reason I suggest using lightweight materials such as straw bales and post and beam framework for the upper story. Bales are the same width as earthbags so everything lines up perfectly. To handle standing on the top of the structure ..experiment ..build a small retaining wall..or something simple.. Sounds great Mickey, thanks for the info. Planning to build a small house and would love to use PP tubes if possible bit have only heard about the rice bags in Philippines, never tubes. Any ideas? I am thinking about building an earth bag home in Philippines also and am trying to find out where I can get polypropylene bags or preferably tubes in Philippines. I am having trouble finding them. Poly bags are used for all sorts of things such as rice and other grains, flour, fertilizer, animal feed, etc. Focus on bag suppliers in big cities. Let us know if you or someone else in the area finds them. One tip is to find the end user who has lots of used bags. This includes breweries, farmers, etc. Make sure they’re in good condition. They must be stored out of sunlight. Search this site for keywords Confined Earthbags. This method combines concrete with earthbags as you describe. You can interconnect the two with barbed wire and/or rebar. We are also looking for a supplier of raschel tubing in Philippines … did you find any supplier ? It sounds like the forms that the bags are initially pounded in is a large part of what makes them so ‘square’. Is there any detailed description or pictures of this (these?) form(s)??? I would love to get the near masonry look, and tight fit for the first few small out buildings. I also notice the alternating grey ‘stripes’ going up the wall. What are they? I’ll do a detailed description soon on how they do their earthbags. The gray stripes have nothing to do with anything. You can pin the bag corners to get squared corners. Remind me again, does hyperadobe walls need barbwire added to it? Thanks. We recommend polypropylene bags or tubes in earthquake prone regions, because the material is stronger. Non-earthquake areas: Over all, hyperadobe seems like the best earthbag building method for most areas. No barbed is needed, especially if you pound some 1/2″ rebar down through the center of the bags. Look closely and you’ll see the perfectly flat walls, straight corners and level courses. Most people in the world want houses with straight, flat walls that look professionally made. Achieving this level of building skill with earthbags is just one of Tamayo’s accomplishments. I like it! “Everybody wants one” is the test for survivability in the marketplace. I might prefer adaptions also, but, I think it is wonderful an Earthbag build is getting such real support and demonstration! You got to “see it all” in your recent travels. In general, how do you feel about Earthbag Technology catching on in SE Asia? Earthbag building is definitely gaining acceptance in the Philippines, that’s for sure. The architects and engineers there are learning about this approach and gradually creating projects. The upcoming earthbag school project in Nepal in March was designed by a Filipino architect, for instance. The vice president of the Philippines architects association has expressed interest in doing more earthbag projects, particularly schools. The climate, and the prevalence of typhoons and earthquakes all make earthbag an excellent choice. I wonder how much each bag weighs? Heavier than concrete block no doubt. Looks great though. The previous article about Coron said the bags weigh 30 kilos = 66 pounds. So yes they’re heavy, but not too heavy for strong construction workers. They make very thick, strong walls. That’s one reason the locals love these houses and all want one (= subject of upcoming blog post). One could debate the pros and cons all day long, but the bottom line is the people in this village really like these houses and everyone is eager to get their own earthbag home. Are these bags specially manufactured with the openings on top, or are the opening on the side still and only slit on top? I have been undecided on the fastest best earthbag method out there and I still think Dr. Anderson’s channel sewed bags combined with raschel material for the bags would be the the ultimate earthbag technology method. Any thoughts? It all depends on what materials you have available. Dr. Anderton’s tubes are for deserts where there’s little or no clay. Sand will fall through raschel mesh. Dr. Anderton uses specially sewn polypropylene tubes so the sand doesn’t fall through. The bags in Coron as specially made as I described. The ends are gusseted and there’s a plus-shaped opening (two slits) on top for filling. In general, Kelly and I like the hyperadobe method best. That assumes you can get rolls of 18″ wide raschel mesh and have soil with enough clay to bind it together to make solid walls. Do you know if they added anything else to the local Dirt ..like sand ? Would you suggest adding sand ? Also can’t quit understand why the cost of materials was even that high? You might want to go and visit. They were very helpful in showing and explaining everything to me. They added cement to stabilize the soil (1 part cement to 7 parts soil). Just by the looks of it, I would say cement stabilizer is not needed if you plaster the walls. I would use tubes, round the corners slightly as I show on my Disaster Resistant house design http://www.naturalbuildingblog.com/open-source-disaster-resistant-earthbag-homes/ and pound rebar down through the center of the bags and add a concrete bond beam. A flat concrete roof would be the most hurricane resistant. What a fascinating topic. I am delighted to have found this thread because I am planning a project in the Philippines, which will hopefully start in July 2018. My question relates to cement ratios and composition. I know it’s a daft one, but I have to be certain! When you refer to using cement in the earthbags, is the cement wet-mixed or is the cement added dry in its powder state? Second question. What material do you use when constructing the ground floor? You can simply follow standard earthbag building methods that are explained in detail in my earthbag ebook and in Kelly’s books. These methods are way faster than the method used in Coron. No need to mix cement with the soil unless you want extra protection. If so, just mix in 5% dry cement with the soil. It will harden naturally inside the bags. Use gravel bags on lower courses. There you go. I just saved you a ton of money and labor. Your biggest challenge is finding the bags or tubes. Seems weird but I guess they’re not easy to find in the PI. So consider buying a bundle and flying them in from a neighboring country. We’ve covered hyperadobe in great length here on this blog. What they’re doing in Coron is way different. They’re using polypropylene bags with slits in the top for filling. The final product is a giant rammed earth block that makes perfectly flat, straight walls. The previous article by a local newspaper reporter contains some errors. One important correction is the freshly made earthbags are stacked on the wall immediately so the bags nestle together snuggly and so the barbed wire will penetrate the bags.